This evening I was looking for a document and remembered it was probably on an old computer, the computer I had before the one on which I type these words. And isn't it interesting that a computer is considered old if it is a mere 8 or 9 years old (egad, it ran Windows 95). Anyhow, I dragged it out, plugged it in and booted it...then it crashed, and I rebooted it...then it froze and I rebooted it. Then, as I was remembering why I finally gave in and purchased a new one, it booted up fine. Slow, but fine. Anyhow, as I was searching through the small hard drive (by today;s standards) , I came across some photos I had forgotten about, including the one you see above. I can't remember if I shared this story or not (I know I told it to a few people), but I searched this blog and couldn't find it. So here it is. The picture is from August of 2008, almost 3 years ago to the day. I was on holiday with my son in NYC; he was 13 at the time. It was hot; the type of hot that can only be felt in a large city like New York; grimy hot. We had pounded the pavement for much of the day, had eaten dinner, and were now walking through the East Village. I came upon a used book store, and is often the case, was drawn to it like a fly to a flame. I picked up a book by Ernest Holmes (who I was just starting to read at the time, but since has had a great influence on me). Anyhow, in the book he was talking about how not only do each of us have the spark of the Divine within us, but we are all connected, and that whatever we do--no matter how small or big--it effects others close to you in some way. And I truly believe this; I always have. We then left the book store and were walking back to our hotel. The sun had just set and it was finally starting to cool off. 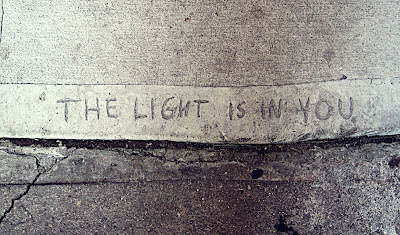 As we were walking, without talking, I was thinking about the book and we came upon the above inscription in the sidewalk. I stood and looked at it in disbelief, and took out my camera to take a picture of it (much to my son's embarrassment). Coincidence? Maybe. But then again, maybe not. 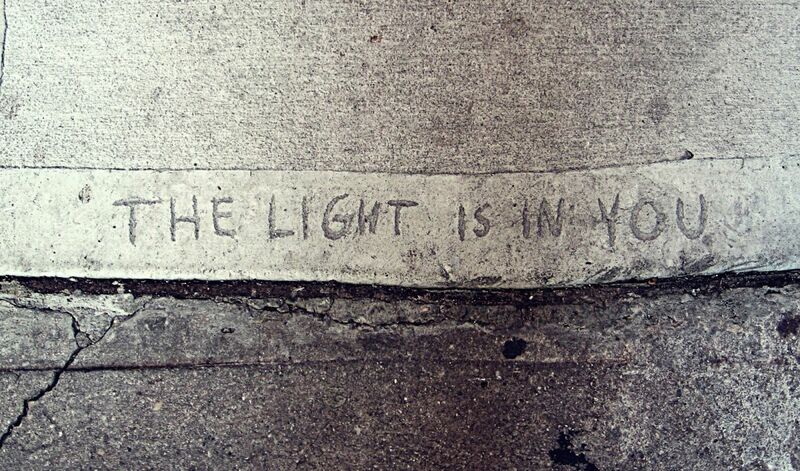 The Light is in you...and me, and everyone you and I know. But sometimes--oftentimes--this is very difficult to remember.